Gornji Milanovac was founded in 1853 by the Duke Aleksandar Karadjordjević, moving the town from the nearby Brusnica (Stara čaršija) into the current location. Next six years the city was called Despotovica (after the river that flows through the city), but when he returned to the throne in 1859, the prince he gave a new name in memory of his brother Milan, who died in 1810th in Romania. In the city, dominate the following buildings: the building of the former City Administration, as old as the city is by itself, where is today the Cultural Centre, Library, Museum of Modern Art, Takovska newspaper and City TV. In front of the building there are white marble statue of Prince Alexander, the city founder, and the Duke Milan Obrenović as well as the bust of the famous Živojin Mišić who was just from this building leaded the Suvoborska-Kolubarska battle in 1914. Another important and dominant building is the Church of the Holy Trinity, Milos’s foundation from 1860. The church was built by architect Nastas Djordjević, whose relatives were also poet Momčilo Djordjević, painter Živorad Djordjević, novelist Slavomir Djordjević and musician Svetomir Djordjević, artists who have certainly left an important mark in their own time. Important characteristics of the city are the Hill of the peace with the monuments of the recent history and the Norway House (Viking ship in the heart of Šumadija) – Museum with an official name “Yugoslavian house of Norwegian Friendship” representing monument of strong connections Serbian prisoners and Norwegians. In the city part known as Brusnica still lives Stara čaršija- Old downtown with beautiful church from the 1836 where lie the mortal remains of the Duke Milan Obrenović, transferred from Romania. Just in his neighbor are located Takovo and Svilajnac and Vraćevšnica and Vujan Monasteries. Takovo has a great significance in Serbian history because in this authentic Serbian town Miloš Obrenović began II Serbian Uprising 185 years ago. In the place where is today dried bush once was beautiful oak under which Miloš Obrenović shouted “Here I am, there you are …” and it is placed in the memorial park where is the monument to the Uprising from 1887, representing a central detail from the paint by Paja Jovanović “Uprising in Takovo”. In Takovo there is famous wooden church from the 18th century where the Archpriest Milentije Pavlović gave to the rebels Communion and the Museum of the Second Serbian Uprising, which is located in the former school building, built by King Aleksandar Obrenović. 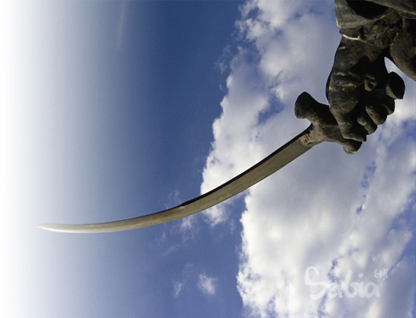 According to the legend Savinac was named after the Saint Sava who has once passed through this little town. They say that even today you can find the hoof print of his horse. Savinac is famous picnic area people from Gornji Milanovac and their guests. There is also famous Savinačka church where are the mortal remains of the Mina Vukomanović , daughter of the famous Vuk Karadzić. The Vraćevšnica Monastery is located in the same named town on the road Gornji Milanovac – Kragujevac and it was built just in the period immediately after the Kosovo’s battle. 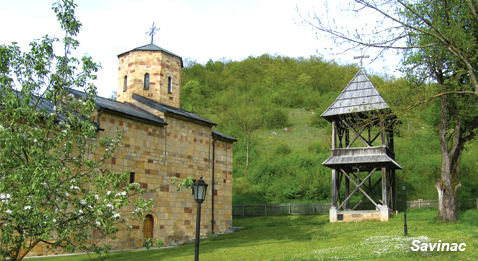 In the monastery there is located a treasure with the copperplate from the 18th century, the Cross from the Second Serbian Uprising, some furniture pieces of the Obrenović dynasty and in the courtyard of the monastery there is a resting place of Baba Višnja, the mother of Prince Miloš Obrenović. In village Gornji Crnući, located 3-4km above the monastery, is palace of the Prince Miloš, which was once even three years the capital of Serbia, but at the 1819 it has been relocated in Kragujevac. The Vujan monastery was founded by the ancestors of Queen Draga Obrenović, popularly known as Draga Mašinand in the City Park in Gornji Milanovac was recently built monument in her honor. The monastery is built in 1905 by Nikola Milićević Lunjevica, a participant of the Uprising in Takovo. Near Gornji Milanovac there is village Ljutovnica where is one more authentic wooden church. 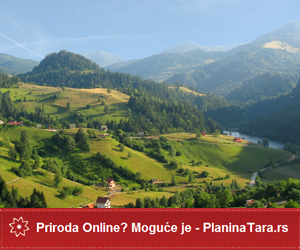 Gornji Milanovac with its surroundings is an oasis for the development of rural tourism that is rapidly growing. So if your accommodation in the downtown is not appropriate, that we have recommended earlier in this text, you can find it in the rural households in its neighborhood. 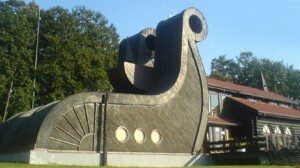 We are sincerely recommend for this kind of accommodation website www.seoskiturizam.eu.